Aquavet Canine Hydrotherapy has a number of documents and forms that can be safely downloaded and saved to your own computer. You can then read them and print them and complete any that are required by us. Click on the appropriate links to download our forms and leaflets. All files are PDF format and can be viewed with the free Adobe Reader software. After losing my 9 year old old English sheepdog this week to cancer I felt appropriate that I thank the wonderful staff at Aquavet for their care and expertise. 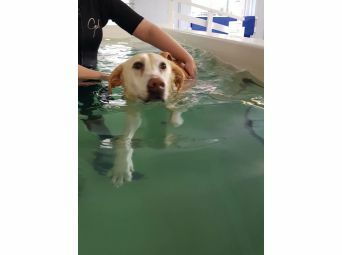 I decided to take Missie to Aquavet after a referral from her vets after trying to maintain the pain in her arthritis. This is a condition that missie has endured even through her young years due to unnecessary docking. We had a session every fortnight for 3 years. The improvement was steady but certainly noticed ! Missie was not a confident dog in water but soon got to know and like the staff and dare I say even got to like her visits ! The staff made our trips good fun , informative and run perfectly ! I would 100% recommend the treatment and Aquavet. Thank you Aquavet. Will miss our sessions. Our dog, Sadie, a chunky 35k Akita cross, first went to Aquavet after a nasty fall from a wall caused her pre-existing arthritis to take a steep dive. She was about 10 at the time and her back legs were badly affected. She started with weekly swims and the occasional physio session. After six months her gait had improved considerably and she settled into a swim once a month, and a physio session two weeks after a swim. This served her very well until she was diagnosed with bladder cancer. After an operation to remove the growths she continued with increased physio sessions for a period until she could resume swimming again. This continued until the cancer returned and she became too unwell for any treatment. In all, we came to Aquavet for about 26 months and during this period her mobility was maintained so that she could enjoy walks in the park and play in the house. I found all the staff at Aquavet to be fantastic. Lisa was sympathetic to the need to keep Sadie separate from other dogs when we arrived/left the premises (Sadie was not great with other dogs) and the care and attention she received from Lisa, Nicole and Becky was lovely. Sadie was so relaxed during her physio sessions with Sarah that she often fell asleep on the platform. In the end it was cancer that caused her death but I doubt her last years would have been as enjoyable for her if she had not attended for the treatments. I have no hesitation in recommending Aquavet to others - in fact I already have. Aftercare - in terms of a Christmas card in remembrance was a lovely touch. Best wishes to the team.